That’s a pretty strong statement – don’t you think? I personally want cooking to be second nature to my girls when it is time for me to send them off into the world, which means I need them to start learning these skills now! It’s no secret that getting your kids in the kitchen – even starting as young as 1 or 2 years old – can lead to many benefits like increased confidence, more adventurous eaters, and quality time together. But it’s also of course no secret that it’s more work for mom and dad to slow down the cooking pace and deal with more of a mess in the process, but I can assure you that it is totally worth it in the end. It does not need to be an every day occurrence …even cooking with your little one only once every week or two will go a long way! Yes, this is another classic one, but again – for a reason! Forget your old pizza routine and make this whole-grain dough together from scratch. 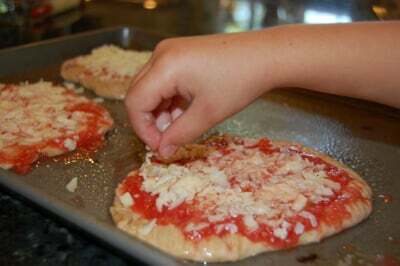 Then come dinner time, divide up the dough so each person can roll out their own personal-sized pizza, and even put on their own toppings. Put plenty of healthy topping choices to choose from – like bell peppers and pesto – in little bowls. 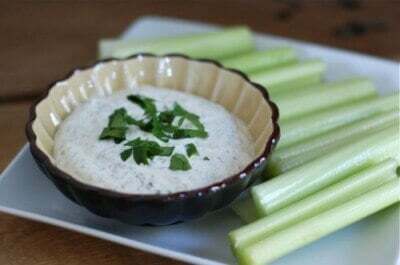 It’s no secret that most kids like to dip their food into something…so imagine their surprise when you help them make their very own flavored dip for veggies and whole-grain pretzels. And trust me this one is easy peasy. What are your favorite “real food” dishes to cook with your kids? Please share (including links) in the comments. And I have one more cute picture of my oldest daughter to share with you :). Happy cooking! 10 Real Food Recipes Every Cook Should Know! Whole Wheat Chocolate Chip mini muffins! combine dry ingredients in a big bowl. combine wet ingredients in a small bowl. make a well in the dry, pour in the wet, stir till just barely combined. I use a 2tbs ice cream scoop (pampered chef) and scoop into an olive oil misted (also PC) mini muffin pan. Bake about 10 minutes at 350! makes 24 mini’s. This is why I can’t cook. I grew up in a household of processed convenience foods and a mother who was always booting us out of the kitchen. My husband is the cook in our family. His mother is an amazing cook. Lindsey, It’s NEVER too late to learn! The key is to start simple and stick to known flavor profiles. Take your cue from cooking shows or even restaurant menus. For example, I now make watermelon, feta, and arugula salads topped with grilled chicken. NEVER would have thought of it had I not been eating at a Greek restaurant. I just made banana bread with my son this morning…he’s almost 2 and helped pour the measured ingredients into the bowl and watch the mixer do it’s magic. He loves to look through our utensil drawer, asking about the objects and then later names what they’re used for when I’m making meals. My nearly 2yo loves stir the ingredients. She slides the dining table chair over to help on her own! She pulls out all the utensils from the drawer and mixes herself. 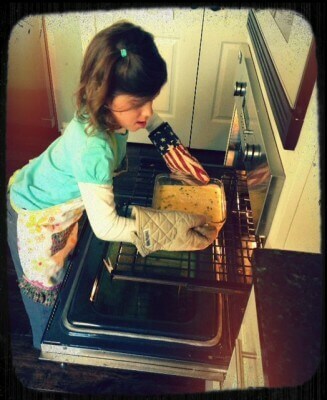 She’ll even help put the batter into the pan(s). I am now a great grandmother and have had all of my children in the kitchen with me, almost from birth. Many are now adults with kids of their own. They all cook and are really good cooks. I taught math to a dyslexic… and reading… How many 1/4 cups make a 1 cup measure…What does the recipe say to do next? Science by explaining how butter melts..and how baking soda works. Nutrition..what else can we add to this to get more veggies. Patience…You have to wait for the cookies to bake. Responsibility. We have to clean up our mess when we finish. Health…Let’s make chicken soup for Mrs Smith who has the flu.we need to wash our hands before we start. Good manners …Lets make a cake for Grandma for having us for dinner. Time management..We will make two meatloaves and freeze one for next week when we will be busy.Money management…I only have $50 for groceries this wek…lets look at the sales and plan our grocery shopping trip….Cooperation…you wash and I will dry… Pride…Look at the amazing cookie tray we made for Christmas. Self sufficiency… You are a big girl…You can get your own breakfast today. Cold cereal and toast for a 4 yr old. I am not certain how people can NOT have their kids in the kitchen with them. It is a fun way to teach them about the world….and in these days of home schooling a fun way to learn just about any topic!! From geography to science, English math,history! Marilyn this is AWESOME and almost made me tear up. I never thought how much what we do as moms teaches our children without it actually being on purpose. I know children are like sponges but this really brought it home. Thank you for being so thoughtful! Oh my – I LOVE this!! Thanks for these thoughts, Marilyn! This is definitely the perfect way to teach children, thanks for sharing this heartfelt comment!!! POPCORN…FROM REAL KERNELS!! WHETHER WE JUST PUT THE KERNELS IN A PAPER BAG AND PUT THAT IN THE MICROWAVE…NO OIL OR ANYTHING…OR PUT THEM IN THE WHIRLY POPPER, IT’S GOOD FOR KIDS TO SEE THAT POPCORN IS A HEALTHY SNACK AND IT DOESN’T NEED TO HAVE ALL OF THE GROSSNESS THAT COMES IN A BAG OF MICROWAVE POPCORN. ALSO, HOW COOL IS IT TO SEE THE KERNELS GO IN AS ONE THING AND COME OUT AS ANOTHER?!! LOL!! We even bought a “tower” for the kids to be at the counter with us. They love counting as we measure, stirring, or just watching us make food. Unfortunately, we had to put it in storage since May, and won’t be able to get it back out till September, plus we have an itsy-bitsy kitchen right now. But then we will have an AWESOME kitchen that will have even more opportunities to help cook. 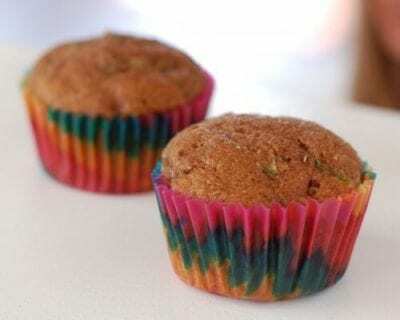 One thing I do notice is that I tend to have them help with baking more than cooking, and need to plan that into our dinners and breakfasts so that they learn that it isn’t all about the sweets (they are just less time sensitive). I have a teeny galley kitchen and 3 girls at home with me. Cooking is MY thing and I hate to give it up but my kiddos (twins that are 7 and my 9 year old) love to be right there with me, watching and asking if they can help. Whether they slice mushrooms at the dining room table for me or stir up brownie batter, they love helping and they definitely overflow our kitchen. I never thought about letting them actually use the stove but it looks like it’s time! Especially for my 9 year old…maybe she can make dinner and give me a break! Thanks for all the awesome advice and recipes, you have no idea how much you have helped my family. My 2 1/2 year old helped me start a batch of soaked granola this afternoon. She also loves to stir anything, pancakes, eggs. I love that she’s already in the kitchen with me! My Sblings ans I before graduation had to make a full meal, make a quiot, sew on buttons, rotate tires fill and check all fluids for the car. Did not make a difference male or female. I have done much the same, but instead of a quilt they have sewn PJ’s or simular item. My boys actually cook better than their sisters. Here’s a picture of my 8 year old with a loaf of bread he made! :) http://2.bp.blogspot.com/-B-Q8cJOyoXQ/T7SJyqZD9oI/AAAAAAAABx8/drntbQ-BzE4/s1600/IMG_5994.JPG I helped explain the directions to him, but he made this 100% whole wheat loaf of bread by himself! I don’t cook with the kids as often as I would like to (working on having the patience for that! ), but I try, and at least I expose them to from-scratch cooking. Love the cute ideas. I follow you on facebook. Could you think of 10 recipes for college kids who are going off to their first apartment and need to learn some simple yet real food recipes to live on? My kids age 6 and 9 are learning to cook, but it wasn’t until I started the 100 days of real food meal plans that there was much structure to it. I have to say when I went to college in the 90s my roommates told me we were “lucky” because we had a cook in the house. At dinner that night, I went to assist with dinner and the only thing the “cook” could make was from a box. Needless to say, the next couple of years I helped other people learn to cook from scratch and find their way around the kitchen, as this is a valuable life skill. I am determined to give my children the skills and confidence to cook from scratch and know how to eat in a healthy manner every day! Thank you for this page it has helped me stay committed to what I set out to do. I am so happy to be following your FB page. My 9 year old, 8 year old and 4 year old recently made a loaf of chocolate zucchini bread entirely from scratch, only asking me to use the electric mixer for them. My son found the recipe online and the two older ones worked hard to find things for my 4 year old to do. I literally sat in the other room trying desperately not to listen and wondering how I was going to manage to eat some of their ‘bread’ without barfing. To my surprise and delight it was delicious. And a prouder bunch of kids you couldn’t find. You simply cannot give that to a child with words or praise – what they got from that exercise was invaluable. Thanks so much for helping families like ours stay healthy! At our house, Monday night is the kids night to make dinner. My son and my daughter take turns being in charge every other week. The first thing they do is plan their menu. I let them pick anything they want to have for dinner. Then on Monday night they make dinner for the family. I stay close by to answer any questions or help when needed. They have learned a lot about cooking. Keeping it scheduled makes sure they have regular opportunities to practice. Their favorite part is getting to choose what they like to eat for dinner each time. I love the look of pride and satisfaction on their faces when we sit down to eat a meal they have prepared. To give credit where it is due, this is part of my our chore teaching agenda that I got from the wonderful book Cleaning House by Kay Wills Wyma. Quiche! We actually just made a crustless quiche. I usually just use up things I have around the kitchen. Today it was with frozen spinach, fresh diced tomato, fresh mozzarella, parmesan cheese, and of course the eggs (adding some milk and sour cream). 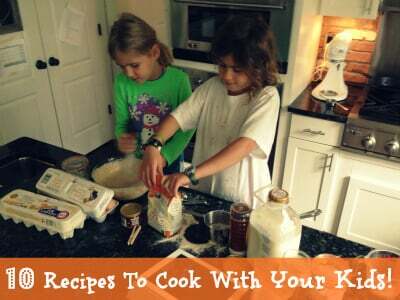 Kids can help pick the ingredients and making it. Yummy good and quick lunch! My family was supposed to go out to a baseball game tonight, but my oldest (10) was too tuckered out from a fun filled day with his friends and opted to stay home with me. I realized that I now had time to make more whole wheat “pop-tarts” and decided to ask him if he wanted to help. You can’t believe how pleased I was that he gladly turned off his Kindle and helped me make them. It was GREAT. He can also see how much work goes into them and why I can’t just whip up a batch when he demands them. Oh – we call them personal pies because they taste just like pie and my kids can’t believe I let them eat them for breakfast. Also, I cook down apples or fresh berries with some flour, a tiny bit of sugar and cinnamon and use that as the filling. I drain the extra juices from the berries so it doesn’t run out of the pastries in the oven. This way you get more fruit than the jam version. Kim – would you share your “personal pie” receipe, please? Would love to try it! Thanks! 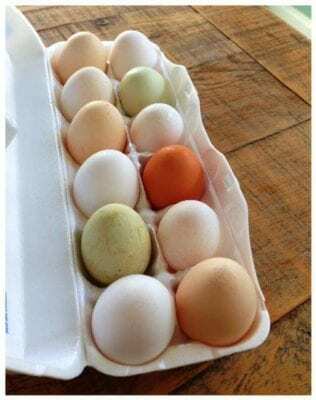 Hi, I can’t remember if it was here or on food babe.com website, that gave a website where you can quickly type in questionable ingredients that you don’t recognize on labels, and they come up with infor and also color coded as to green/yellow/red on level to avoid? Cooking with kids is so important. I think it creates an understanding and apperciation for food and their parents. My daughter and I love cooking together. It is a great way to spend time together and a wonderful way to learn about food, measuring and math, real life expereince, and mixing and chemical reactions. I am not only a health coach for individuals and my family, but I homeschool my daughter. Cooking together is the most rewarding lessons we do. We get to make nutritous and delcious food with a whole lot of love. Thanks for all of your wonderful recipes, tips and tricks…we love them! My boys love making your Powerballs: https://www.100daysofrealfood.com/2010/06/05/recipe-powerballs-two-versions/ . I find they like to make anything involving ‘power tools’, in this case the food processor. 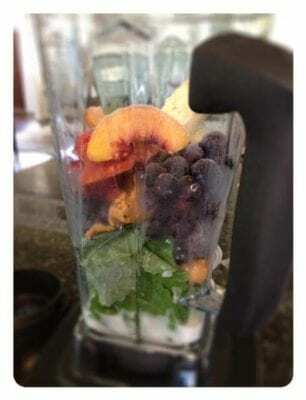 Thank you for posting these easy and yummy (and healthy) recipes! My girls LOVE to help cook! They especially love trying recipes found in picture books or magazines like Family Fun or the Penzy’s catalog. 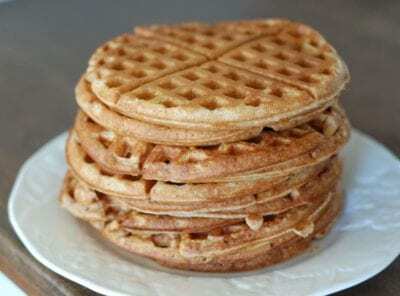 Of course, I adjust the recipes to make them healthier. I find baking especially doable as even my youngest kiddo can dump flour or stir batter. Though, I do find recipes take a LOT longer with my girls helping, so I usually eschew their offers for help on busy weeknights. My sons are now grown and all of them are wonderful cooks. We started when they were very young. The life skills learned are priceless. 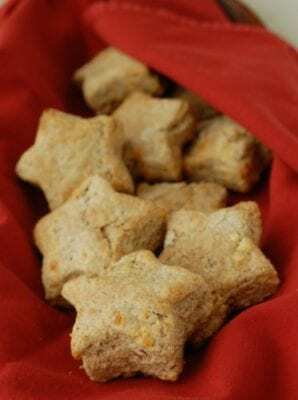 My daughter (5) helped make your Easy Cheesy Crackers and not only did she have so much fun making them but she’s so proud to share them and eat them. I can see the twinkle in her eye when she sees me serve the crackers that she made. Thank you for all of your wonderful tips and delicious recipes! Keep them coming. My 2 year old daughter LOVES to mimic me in the kitchen, and at times, her play kitchen just isn’t enough of a challenge for her. Last night, we made whole wheat pizzas, a kale salad, and fresh cantaloupe for dinner. I cut everything and then she placed the cheese on the pizza, the kale in the salad bowl and the cantaloupe in her mouth :) I even caught her eating fresh basil and big chunks of tomato. We had so much fun and when my husband got home, she proudly announced, “Mommy and Winnie made dinner!” I love you blog, your recipes and your tips for wholesome living. Thank you for sharing these with us! What a sweet name for your daughter! I love the name Winnie! How cute, it’s a name I never thought of! My kids and I have made this several times and they love it! 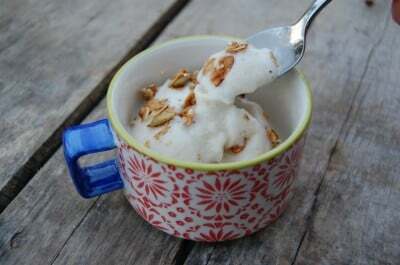 It can serve as ice cream or keeping it in the fridge as pudding. The last time we made it my 4 yr old also added honey to his, and it was heavenly delicous! My kids are not big banana fans, but you can hardly taste the banana in this recipe. I also love it because it is a good source of protein. My son, right at age 4, completely understood mixing dry ingredients and wet ingredients separately from all of the baking and pancakes we have made! My two year old loves dumping and stirring and helping since he was one too! It can be frustrating when trying to get dinner done in a pinch, but this post was a good reminder for me to get them back in the kitchen. I should be excited that they are so eager to help and not squash their enthusiasm for such an important life skill! I had struggled to learn to cook in my early years of marriage, taught many things by my husband who cooked often as a kid. Thanks for sharing. Excellent article and ideas! So true about teaching cooking as a life skill. Being able to cook some simple basics from scratch is essential. I wouldn’t want my kids depending on processed foods and take out for their meals! Cooking is a PROCESS. When you cook, you are processing your food. Heat depletes the available vitamins and minerals and degrades fats and proteins. Whole grains are not a health food: read Wheat Belly book. Raw fruits, vegetables, and nuts, organically grown, are the highest grade of foods to feed our bodies. My issue is with messiness and fighting. My kids fight over everything when we try to cook together and one can’t seem to help tasting and licking everything, often raw items that should not be tasted. I often end up very frustrated after trying to cook with them which is a shame because I love to cook and I would love to teach them. I hope they outgrow this!! My parent’s started me cooking from as far back as I can remember and by the time I was 15 I was capable of cooking all of the family meals on my own. By the time I went to college and apartments on my own I was the only one of my roommates capable of cooking meals entirely from scratch. 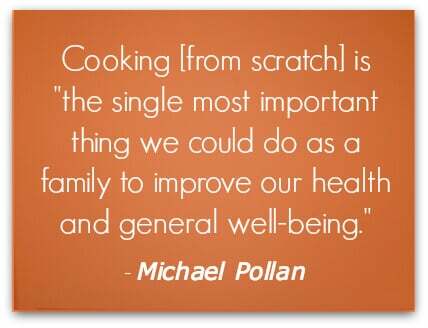 Cooking from scratch is much cheaper and healthier than from store bought. My parents never regretted teaching me from a young age. It is truly an important life skill everybody needs to know. I’ve had roommates who couldn’t and it was terrible. I can’t imagine how boring and terrible for you it would be to live on microwave burritos and easy mac. 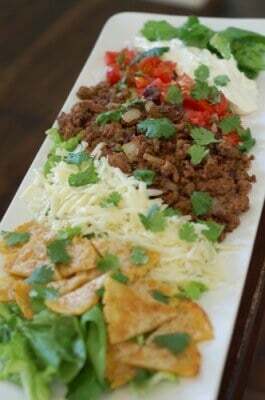 I used to love to help out in the kitchen growing up – I was raised in A central American country – where, people went home for Almuerzo and siesta ( Lunch and Nap ) and then return to school and work … in the summer time, I would prepared appetizers for my dad and have these ready when he got home for lunch ! …. I now leave here in the US since the 70′ been married now for 18 years – and belong to a CSA where I profile recipes I learned growing up and these are a well received, even the most simple Bean soup with all the fixings :)! We like to know where our food comes from we like to stay organic fair trade local and sustainable :)! I have the same problems with my seven year old of the kitchen being destroyed and dinner an hour late… We’re working on making batches of muffins for her lunches on weekends and her helping me plan meals as well as learning to wash ingredients and the like. We’re vegan at home which means a lot of meals made from scratch, and even if she can’t help that night, if she asks I always explain what I’m doing! My daughter has been in the kitchen with me since she was an infant. As corny as it sounds, I’d have her in a bouncy seatand talk to her as if I were hosting a cooking show, telling her what I was doing and why. I knew I was getting through when she started putting her play food into a “hot degree oven”as soon as she was old enough to play kitchen with her dolls. Now that she is eight, she is a huge help in the kitchen, and she’s starting to teach her baby brother all she knows right alongside mama! She likes to make up her own recipes and she even cooks dinner all by herself from time to time. Plus, the kitchen is a great place to reinforce math and science skills. I love following your posts!! We are on our own journey to clean eating! We just discovered the best milk, we seriously LOVE it! It looks like you buy the same milk!!! Is that the non-homogenized whole milk from earth fare?!? We LOVE it!! My 13yo son makes a killer chicken noodle soup. He takes seasoned chicken from the freezer (I cube it, season w/garlic, s&p, parsley, whatever else looks good and freeze in meal size packages), adds veggies (both fresh and some that I’ve dehydrated) and cooks in water. He cooks whole grain noodles on the side. You put the noodles in the bowl and ladle the soup over so the noodles don’t get nasty if you have leftovers. He loves cooking for us. Our next step is to teach him how to prepare the seasoned chicken for the freezer. All of these meals seem like a great place to start. I was wondering though… Every time you bake/cook with whole grain, are you grinding your own wheat? It would seem that making a top 10 healthy recipe would be easy with 1000s of healthy options out there. I can not understand how so many wheat products made the list. Also, how is it that fudgcicles and ice cream made the top 10? In my opinion, if these are the first 10 recipes we are teaching our kids we are in a lot of trouble. My 28 year old coworker doesn’t know how to cook from scratch. As in, “I don’t know how to cut vegetables.” I was so excited for her when she made a pizza herself (store-bought crust, but still impressive). And I talked her into agreeing to learn how to make her mom’s homemade macaroni and cheese to bring to the Christmas potluck at work next month. I’m also thinking of getting together with the other people at work and putting together a bunch of simple recipes for her. My six year old twins just got mini baking sets for their birthday, which including little mini baking shaped baking pans (butterfly, heart etc) which we use to make individual crustless quiches – they put some chopped feta and sliced olives in the bottom of the pans, whisk and egg and pour it on top and then I put it in the oven for them – they come out looking great! My fifth graders make eggs – omelettes, over easy and scrambled. They also make guacamole. I have 4 granddaughters and they love to help me bake:) They range in ages, from 1 to 10 years old and there is something for each one of them to do, they like licking the spoon and even like cleaning the kitchen together, this is truly quality time spent together as a family. drizzle olive oil in chicken cavity and then stuff with 1 sprig of Rosemary, apple, celery, and one onion. Cook at 350 for 1 1/2 – 2 hrs. My 8 year old son makes the best guacamole! Put all ingredients into a bowl and mash with a pastry cutter! Yum! He loves to cook! My 2 year old made the whole wheat biscuits tonight by himself! And they turned out great. I measured everything in separate bowls, diced the butter, and then he climbed into his learning tower and took over (by force). He’s seen me do it enough times, I guess. He used a pastry cutter for the butter (HUGE MESS) and patted out the dough and made circles. I watched on sort of proud and horrified. All I had to do was put the biscuits in the oven and set a timer. Oh, and get a mop. And they really tasted good–talk about kidproof. Very proud mama and grateful for wonderful recipe! I love this comment! “I watched on sort of proud and horrified.” I have a sneaky feeling this will be me tomorrow. I know this is an old post – but I just recently purchased the Kids Kitchen recipe box for my 4 and 6 y/o boys and we love it. It’s all vegetarian, real recipes from scratch. A wide variety of snacks, desserts, and main courses. We’ve made lentil dal with yellow rice, and we’ve done bean burritos. It’s been great! So happy to have stumbled upon it and upon your website too. I LOVE it! We love to make granola, quiche, cookies, energy bites, homemade pizza, granola bars and muffins together. ehen I was doing my student teaching & living with my cousin’s family we all had a night to make dinner. Even the 7-8 year old. He would often make grilled cheese or homemade pretzels with soup (from a can) but it was great to take the pressure off of their mom. I plan on doing something similar when my kids are older (currently they are 3). My kids are 10 and 12. They started being responsible for dinner one night a week, each, during the summer a few years ago. At that time it was them choosing and helping me cook. Now they find their own recipes, look through the grocery ads for sales, check the pantry and fridge before making their shopping list, find the ingredients they need when we are at the store, and know that dad and I are available if they need help. Tonight the 12 y.o. made fish tacos from the fish her dad caught this weekend, with mango salsa, beans, and Spanish rice.